Bullmastiff history is a relatively modern day story of how people can solve problems by putting dogs to work. 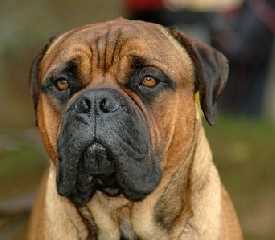 Called the "Gamekeeper's Night Dog", the Bullmastiff is calm, confident, gentle, and devoted to those he loves. But if he is threatened, he turns fearless. At upwards of 130 pounds or more, this powerful dog has an air of authority. And they rarely bark. But what makes their history so unusual? The word Mastiff is derived from the French word “mastin” meaning accustomed to the hand. Mastiffs are a group of dogs that were once called Molossians, and any giant breed regardless of their appearance or the type of work that they did was classified as a Molossian breed. Many of the original Molossian dogs are from Asia and have been around since antiquity. But the Bullmastiff is only about 60% Mastiff, the rest of his genes comes from the English Bulldog, but not the Bulldog we recognize today. Rather the 19th century bulldog, which was a vastly different looking dog than today’s version. The modern day Olde English Bulldogge is believed to be the closest recreation of what was used in the development of the Bullmastiff. Bullmastiff history begins around the end of the nineteenth century, or 1860 to be exact. Wealthy large-estate owners were having problems with poaching on their lands. This landed gentry had massive estates that included forests teaming with wildlife. The wildlife was needed by the owners to put meat on the table and provide food for their hundreds of servants. Poaching at the time was a capital offense, and the Gamekeeper was responsible for catching those that poached on the landlord’s livestock. Poachers could easily take animals, but they also put gamekeepers’ lives in danger. Poachers would rather kill the gamekeeper, than get caught poaching and facing the hangman. Without the security systems we now take for granted, nineteen century gamekeepers needed something that could protect them AND protect the animals in the forests they were guarding. They needed a courageous dog that could be very quiet, and attack on command if a poacher was seen. The dog needed to be powerful enough to subdue a man, without mauling him. But such a dog did not exist. YET . . . . . The nineteenth-century version of the English Bulldog was much more ferocious than today’s version of the breed, BUT it wasn't big enough, and the purebred Mastiff at the time was not fast enough nor aggressive enough. So breeders of the day crossed the two, to create a dog that could do the job. There is also some suggestions that gamekeepers used other breeds such as the Great Dane to add size to their dogs. But before a breed can be accepted into a kennel club such as the Kennel Club in Britain or the American Kennel Club, they must breed true. By this, I mean that the new breed must be bred to itself without the help of any outside breeds. It takes generations until this happens. Rather than continually cross the two breeds, breeders put forth efforts to create a pure strain. These dogs had to work at night, so a dark brindle colored hair was preferred to help the dog blend into his environment. They became known as the Gamekeeper's Night Dog. The Bullmastiff is the result of 60 percent mastiff and 40 percent bulldog. As poaching decreased, the dogs were used as guards. The resulting Bullmastiff was a powerful, strong but almost silent dog. The Gamekeeper could quietly work his way through a forest towards a poacher, confident that the dog would not betray his position. When close enough, the Bullmastiff would silently rush the poacher, grabbing him by the arm and keeping him down until the Gamekeeper arrived. By 1924, the breed was pure and was recognized by the British Kennel Club. The American Kennel Club followed in 1933. Today, they are listed as number 44 in popularity in the United States by the AKC.